This new video series is an extension of what I teach in all of my online classes. 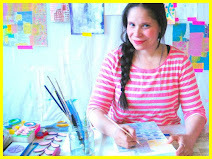 I will show you some creative and easy ways of making canvases, paints, collage paper and a variety of other mixed media items. Take everyday items and make your own art supplies out of it. © 2015 Alma Stoller. Simple theme. Powered by Blogger.